The topic of today’s review, Sherwin Williams Duration Home, is not a new product. This product is several years old. It is so good, however, I thought it deserved some attention. 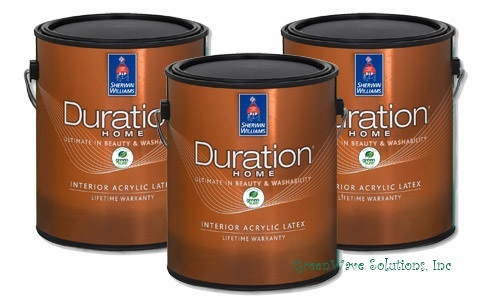 Duration Home is the interior line of Sherwin Williams’ Duration brand. It was the flagship paint for high end, interior durability until Emerald was released. Duration Home comes in matte, satin, and semi-gloss finishes and has all color bases available. This product is low-VOC and has a great finish. Upon opening the can, you will notice that the Duration Home is not very thick. It also has that ammonia like smell that high end, low-VOC coatings have. Everything is pretty normal inside the can. As soon as you start painting with the Duration Home you know that you are using a great paint. The thin body of the paint makes its application a breeze. It easily loads onto brushes and rollers and transfers smoothly onto walls. The most impressive things is that despite the thin body of the paint, its hide is as good as any paint I’ve used. Because the matte finish has a bit of sheen, make sure that you paint into a wet edge to avoid hat-banding or picture framing. I used Duration Home to paint a bathroom in my condo and after 6 years it looks brand new. I am not a neat freak by any stretch of the imagination. The Duration Home has stood up to water, neglect, and even some abuse. I have intentionally been rough on it to see what it can take. This product lives up to its durable finish claims. I am impressed with the Duration Home product. I have liked it since Sherwin Williams released it about 10 years ago. While it was one of the first “premium low-VOC” interior paints, it still competes with the newer products. Duration Home prices have gone down with the release of Emerald which makes Duration an even better choice. I like everything about Duration Home matte. President of GreenWave Solutions, Brookhaven painting company and Alpharetta house painters. GreenWave Solutions offers the best painter services in Alpharetta, Atlanta, Dunwoody, Decatur, Sandy Springs, Roswell, Brookhaven, Duluth, Grant Park, Inman Park, Buckhead,Milton, Midtown, and more! Because GreenWave Solutions is has good relationships with the paint companies, we get a lot demos and samples of products. The most recent was a gallon of Sherwin Williams’ Emerald interior matte. I have wanted to try this product out since they released at the beginning of 2012. SW says that Emerald is the interior paint of champions! The first thing I noticed about Emerald was its thickness. It is a heavy-bodied coating; thicker than SuperPaint. 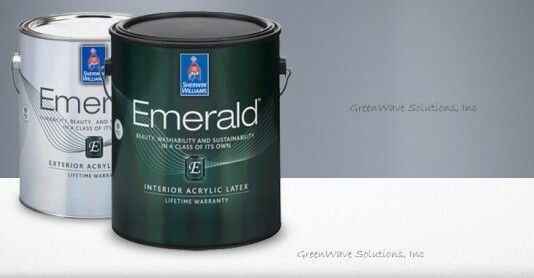 Emerald has that familiar ammonia smell that is synonymous with high performance 0-voc coatings. It has a strong smell, but they say it isn’t bad to breathe. We pushed this product to its limit. We painted off white satin walls in a bathroom. The Emerald did a good job. Its self-priming feature did a decent job adhering to the shiny satin paint. It did streak and smear some. The dark red covered pretty well with one coat; however, we a second coat was needed for complete color change. Again, I want to reiterate that I was asking this paint to do something “impossible.” Overall, Emerald lived up to its hype. I checked the finish after it had 24 hours to dry. It was exceptionally hard and still very smooth. Emerald has the most durable and smooth finish of any interior architectural coating I have ever seen. Sherwin Williams’ Emerald Interior product is excellent. It delivers all of the performance that they say it will. This performance does come at a price. This product costs nearly twice as much as the next best interior paint, Duration Home. If you want the best paint money can buy, then Emerald is for you. If you want the best value, I recommend the Sherwin Williams Duration Home Matte. I was helping my cousin do some interior painting this weekend and realized how little the average person knows about proper painting techniques. Oftentimes I struggle to think of topics about which to write because I can’t think of anything that people don’t know. I guess I have been over thinking it. I’m going back to the basics for my readers. When choosing a roller, there are three factors that you must define: nap composition, roller quality, and nap length. Nap refers to the fur on the roller. Composition refers to what the nap is made of. 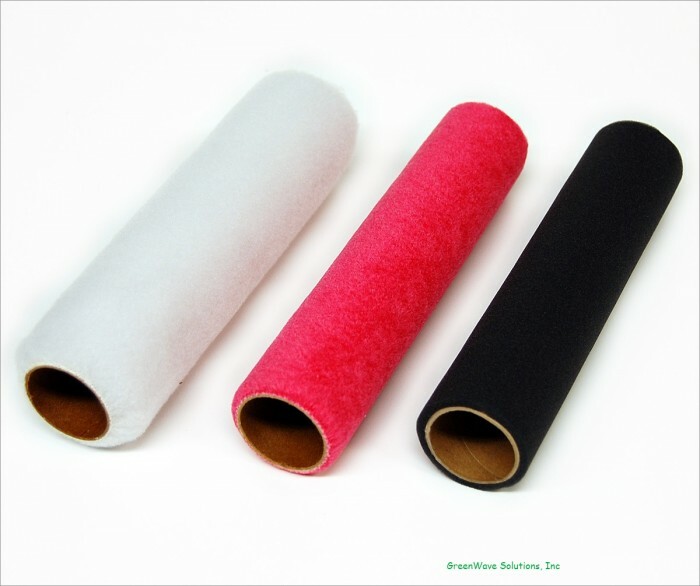 When choosing what type of roller to use, you need to know what kind of coating you are using. Alkyds, acrylics, polyurethanes, and lacquers all require a different roller nap. You use specific rollers for some coatings because the stronger chemicals can cause the nap to melt. Also, using a roller designed for the coating causes the paint to load and release better, which yields a better finished product. Manufacturers label the packaging to specify for which coatings are compatible with the roller. A sure fire way to choose the correct roller composition is to choose your paint first and then choose a roller that works with it. Not all rollers are created equal. Like with most things, the adage “you get what you pay for” applies to rollers. The difference between cheap and expensive rollers boils down to two characteristics. Cheap rollers tend to lose more hair while painting. These hairs end up on whatever you are painting and dry in film. This is ugly and unprofessional. In addition to this, the nap on cheap rollers typically doesn’t offer good release which renders a less smooth finish. The only time I recommend using the cheapest roller available is when you are painting something where quality is not a factor – like a dog house. Professional painters Trick of the Trade: Before using any roller, put the roller on the frame and wrap it with painter tape. Remove the tape before you start painting. This pulls out the loose hairs and prevents them from ending up on your substrate. Nap length is the last factor you must determine when choosing a roller. Nap length is measured in inches and range from foam, mohair, 1/4″, 3/8″, 1/2″, 3/4″, 1″ and more more. What determines the length of the roller nap is how rough of a substrate you are painting. If you are painting something super smooth like glass, then you should use a foam roller. If you are painting something very rough like stucco, use the longer 1″ nap. By using the right size nap, you ensure that you apply an adequate film of paint and get the smoothest possible finish. I hope that this answers any questions about how to choose a roller. President of GreenWave Solutions, Atlanta painting company and house painters. GreenWave Solutions offers the best painter services in Alpharetta, Atlanta, Dunwoody, Decatur, Sandy Springs, Roswell, Brookhaven, Duluth, Grant Park, Inman Park, Buckhead,Milton, Midtown, and more! GreenWave Solutions is the best painting contractor in Atlanta. Efflorescence. What a weird word. Efflorescence – ef-flo-res-cence (ef∋ le res∋ens), 1. a change on the surface to a powdery substance upon exposure to air, as a crystalline substance through loss of water. 2. to become encrusted or covered with crystals of salt or the like through evaporation or chemical change. In English, efflorescence is that white, powdery stuff that you see on masonry walls. Because this isn’t a chemistry class, we are going to focus on prevention and remediation, instead of causation. Although efflorescence is ugly and sounds scary, prevention and removal are simple and inexpensive. This is very easy. Make sure that the masonry substrate is at least 14 days old. If it seems uncured or “hot”, wait another week. 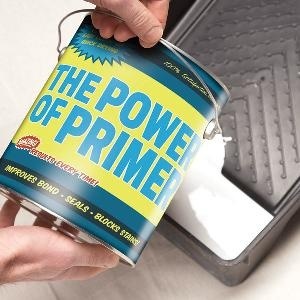 Then, prime it using a masonry primers. Sherwin Williams makes a great product called Loxon Primer. Once you have primed, simply apply an appropriate top coat and you are done. If you followed all of the manufacturer’s instruction, you should not have any problems with efflorescence. This is more difficult than prevention, but it isn’t a huge problem. First off, efflorescence is a cosmetic problem. It does not degrade the monolithic strength of the substrate. The efflorescence on the wall pictured above is ugly, but it won’t hurt the wall. So if you have efflorescence and it doesn’t bother you, leave it alone. If its unsightliness does bother you, here is how you fix it. 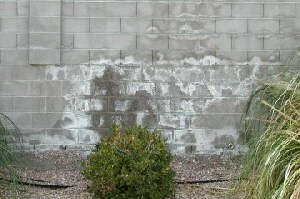 Clean the efflorescence with muriatic acid. Be careful; hydrochloric acid is nasty stuff. You may need to dilute depending on the molar strength. Make sure you have rinsed all of the muriatic acid and allow everything to dry thoroughly. Prime and repaint using the system described above in the “prevention” section. I hope that you were entertained while reading this riveting expose` on efflorescence. GreenWave is also the best interior house painters, exterior house painters, and house painting company and serves Atlanta, Alpharetta, Brookhaven, Buckhead, Chamblee, Doraville, Dunwoody, Grant Park, Inman Park, Johns Creek, Duluth, Milton, Roswell, and most major suburbs.